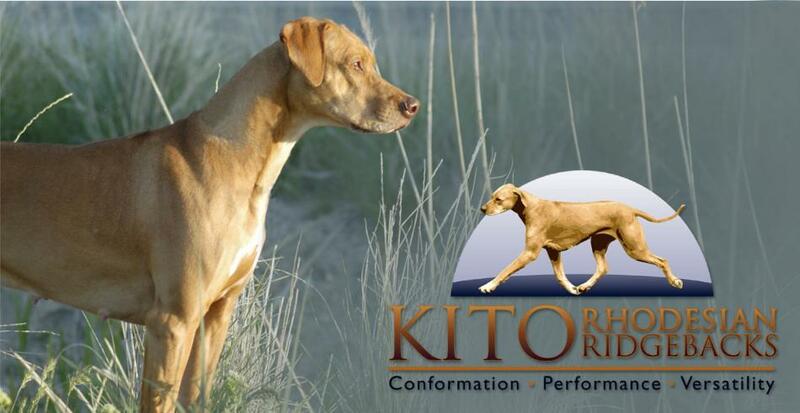 Kito Rhodesian Ridgebacks is a small hobby breeder of exceptional quality Rhodesian Ridgebacks puppies located in Salt Lake City, Utah. I first became involved with the Rhodesian Ridgeback breed in 1996, when a special soul entered my life. "Kito" introduced me to the world of the Rhodesian Ridgeback and showed me what an amazing and special breed they truly are. Sold for Life! I began competing in performance events in 2005 when I started in lure coursing. In 2006, I acquired Xhabbo a gorgeous liver nose show puppy from Ridge View Ranch Ridgebacks, and I started in conformation with outstanding results . Xhabbo is a multiple Best of Breed winner, Hound Group placer and Top 20 Ridgeback female in 2008, as well as Grand Champion, Dual Champion and Best in Field winner. A DREAM come true, Xhabbo has proven to be an excellent example of the breed and has produced exceptional offspring, including 5 Champions (earning Xhabbo a Register of Merit with RRCUS), 2 Grand Champion, 3 Group placer, 4 Best of Breed winners, RRCUS National Specialty Award of Merit winner (2014), multiple Best in Sweeps/Best of Opposite in Sweeps winners, UKC Best in Show winner and a Multiple Best Puppy in Show winner. I bred my first litter of Rhodesian Ridgeback puppies in 2009 and typically have 1 litter every year or so. My goal is to breed Rhodesian Ridgebacks that adhere to the AKC breed standard as closely as possible, to preserve breed quality, and to abide by the Rhodesian Ridgeback Club of the United States Code of Ethics. I have been a member of the Rhodesian Ridgeback Club of the United States since 2006, and served as Treasurer of the Board of Directors from 2007 - 2009. Also a member of the Utah Sighthounds Racing and Coursing Club (www.usrcc.org. Special Thank You to Susan Ralston of Ridge View Ranch Ridgebacks in Morgan, Utah and Danielle Sand of Ivy League Ridgebacks in Rhinebeck, New York for their mentorship, support, and providing me with outstanding Rhodesian Ridgebacks for my foundation. Very Special Thanks to co-owner, co-breeder, and Handler Extraordinaire Sally Swenson, AKA The Lady for helping me get started.